Costly Reynolds 531, Columbus, Tange, Vitus butted bicycle frame tubing -- thick-walled at the ends for strength, thin-walled in the middle for light weight -- is an essential element of a top custom framebuilder's masterpiece. A vintage, silver-brazed steel-frame bicycle with butted tubing is, well, priceless. But -- a moment of carelessness when parking a bicycle can quickly result in tragedy. A thin-walled frame lands on a fencepost, stump or rock. BOOM, it's dented, ruining the bicycle's appeal and value. What is to do? You must remove that dent! But -- how? Some dent-removal tools use "frame blocks" to compress the tube from the outside. This is a wimpy, ineffective method only used by retrograde, old-school mechanics. After all, the dent is to the inside. You might stuff a steel rod down a seat tube or head tube, to push the dent out. But it only gets pushed partway out. A framebuilder may replace the entire frame tube -- a trick to boost profits. The damaged tube has to be sawed apart, remnants ground away, new tube brazed in, the entire frame repainted. This can cost well over $1000 and you won't have your bike back for weeks or months! How can you be sure that the replacement tube is of the same quality as the original? 1. Lay our ShelBroCo Dent Location Gauge Wire along the outside of the frame, to measure the location of the dent. Flash Dent Remover to the end of the wire. 3. 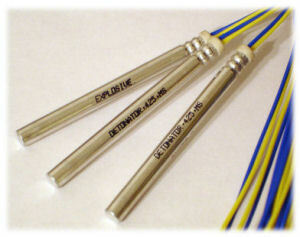 Insert the Gauge Wire with attached Flash Dent Remover into the tube, to the depth you measured. Thanks to our Electrical Actuator, the hazard of premature actuation is drastically reduced! Remarkable Restoration -- but of Course -- Use with Care! Dent gone -- in a flash! A bit of touch-up paint and it's like new! But -- any powerful tool must be used with appropriate care. ShelBroCo Flash Dent Removers are sold in ten strengths -- Grade 1 to 10. Start with Grade 1 and work upward. The tube shown in the image below may look mildly abnormal if you mouse over it, but that is probably a Photoshop job -- a crude attempt at insurance fraud. Still, caution is certainly appropriate. Road Runner, Road Rider, Road Kill! Beep beep, boom boom, bye bye!! NOTE: Thanks to their special qualities, ShelBroCo Flash Dent Removers must be shipped by our Special Courier Service and delivered to a Registered Storage Facility (see User Agreement). ShelBroCo Flash Dent Removers cannot be shipped by air and will not be accepted by the U. S. Postal Service or conventional shipping services. Other components of the Dent Removal System may be shipped by any normal means.